Located on sought-after Moult Road, where properties rarely become available, Murrawingi (which means ‘happy home'), has some of the finest views in South Devon. Situated in an Area of Outstanding Natural Beauty, it offers a peaceful location, unspoilt sea and country views, access to splendid sailing grounds, sandy beaches and beautiful walking tracks. An outstanding contemporary home could be built on this site, with its wide frontage and easy access to a private road. Alternatively, local architects and planning consultants have identified the potential for two separate dwellings on the plot. Any replacement dwelling would be subject to obtaining the relevant planning permissions. 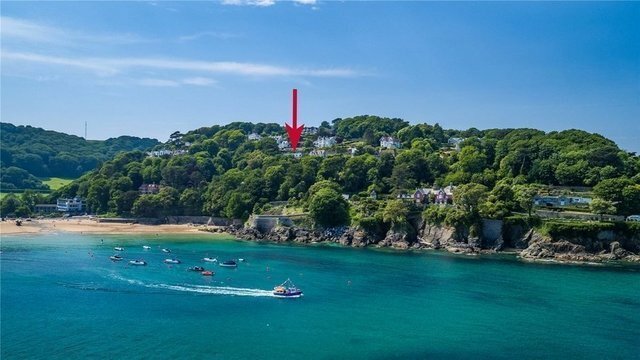 Built in the 1960's by well-known Salcombe builder, David Murch, Murrawingi, which has been with the present owners since 1974, offers light and airy accommodation arranged over one floor. The gently curving design takes full advantage of the views and sunny south-facing aspect. There is double glazing throughout. A utility room, play room/ cloak room, well-appointed family shower room, separate family bathroom, and a twin bedroom are at the rear of the house. To the south, sea-facing side of the property, all rooms fully showcase the spectacular sea, cliff and country views. A spacious reception/ dining room offers an open wood burning fireplace with local stone surround. Wide sliding doors give access to the sunny balcony with its magnificent outlook. The kitchen is fully fitted with a range of stylish base and wall-mounted units and integral appliances, and breakfast table with sea views. Two double bedrooms with fitted clothes storage have south-facing aspect. The exceptional large master bedroom, with fitted wardrobes, and windows to the east and south, has wide sliding double-glazed doors opening onto the south-facing balcony. Leading off Moult Rd, which is a private road, Murrawingi is accessed via its own driveway, with parking for several vehicles.On the south side of the property is a large decked balcony that looks out on the panorama of estuary, sea, cliffs and fields, and provides the perfect space for al fresco dining and entertaining. The view looks over the Bar at the mouth of the Salcombe estuary, and due south towards Prawle Point and the English Channel. The terraced gardens are laid out with flower beds, shrubbery and terraced paths. There is a large woodland area with shady paths, mature scotch pines and holm oaks.